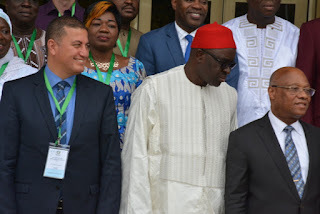 ECOWAS and the Economic Community of Central African States (ECCAS) have pledged their commitment to cooperate in conflict prevention, promotion of peace and stability in the two regions. This is contained in the communique of the Joint Summit of ECOWAS and ECCAS Heads of State and Government held in Lomé, Togo on Wednesday. The focus of the joint summit was to develop measures to address issues on peace, security, stability and the fight against terrorism and violent extremism in both regions. The Heads of State resolved to cooperate in promoting peace and stability in the two regions by implementing necessary measures to tackle common challenges. The leaders urged the President of the ECOWAS Commission and the Secretary-General of ECCAS to immediately open negotiations to conclude and implement procedures on mutual legal assistance and judicial cooperation. The leaders also instructed Ministers responsible for agriculture, livestock and security of the two regions, to hold regular consultations with herder and farmer organisations. They stated that the consultations would be “in order to identify measures for the prevention and peaceful management of these conflicts”. On the issue of illegal migration, the leaders directed their relevant ministers to consider issues on migration and climate change and submit a report in that regard at their next summit. They also condemned illicit activities and trafficking from terrorist and mercenary groups operating in the Sahel from Libya. The Heads of State commended the commitment of member countries of the Multinational Joint Task Force of the Lake Chad Basin and G5 Sahel Joint Force in the fight against terrorism. They called on member states of the both regions to provide material, financial, technical and intelligence support to armed forces in the fight against terrorism in the Lake Chad Basin and the Sahel. The leaders reaffirmed their commitment to combat terrorism and violent extremism by strengthening cooperation with religious and community leaders, women, youth, educational stakeholders, and relevant civil society groups. They urged security services of respective countries to cooperate in the areas of information exchange and intelligence sharing. They further directed ministers responsible for security in both regions to propose “most suitable” mechanisms and procedures for secured intelligence and information sharing among the countries before their next summit. The Heads of State also agreed put in place a Ministerial Monitoring Committee for the implementation of the decisions of the joint Summit which shall meet once every year. They agreed to meet every two years alternately in member states of both regions to review the implementation of the decisions contained in the Lomé Declaration adopted at the Joint Summit. They further decided to convene their next joint summit in Ndjamena, Chad in 2020. The summit was jointly chaired by President Faure Gnassingbe of Togo and President Ali Ondimba of Gabon. The Heads of State or the duly mandated representatives of the following countries that took part in the summit for ECOWAS were Benin, Burkina Faso, Cabo Verde and Cote d’Ivoire. Other West African countries were The Gambia, Ghana, Guinea, Guinea Bissau, Liberia, Mali, Niger, Nigeria, Senegal, Sierra Leone and Togo. Heads of States or duly mandated representatives of ECCAS were Angola, Burundi, Cameroon, Central African Republic, Congo, Gabon, Equatorial Guinea, Democratic Republic of Congo, Rwanda, Sao Tome and Principe and Chad.